The Statue of Unity is a befitting tribute to Sardar Patel. However, the symbolism behind tall, imposing statues is an old one which lacks the awe and aura it once had. 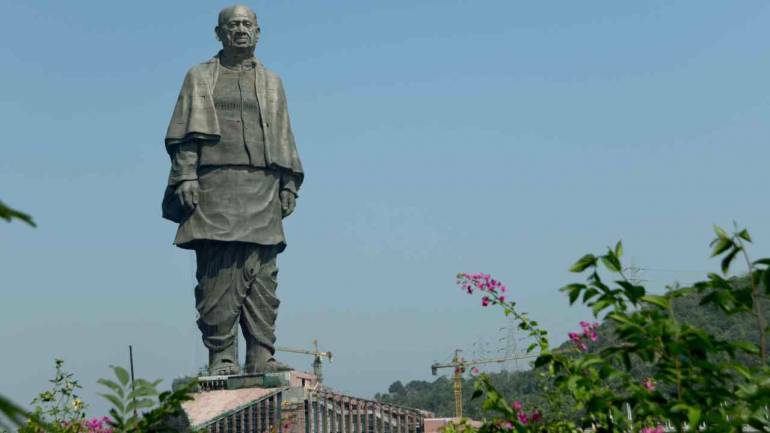 The unveiling of the 182-metre-tall Statue of Unity, the statue of India’s first home minister Sardar Vallabhbhai Patel, at Kevadiya in Gujarat, by Prime Minister Narendra Modi, had all the pageantry that was befitting the stature of the Iron Man of India, as Patel is known . It was replete with a fly-past by the Indian Air Force, dance and music performances and a ‘Run for Unity’ organised in different cities across the country. However, not everyone was happy and joined the jamboree at Sadhu Bet. Many local tribal organisations have planned protests against land being taken for the project and the government not heeding to their rights. Reports also suggested that 16 tribal activists from Narmada district were “detained” for planning protests. If there are voices of dissent being heard now, it is also because a lot has changed since 2013 when the project was announced. Modi, then the chief minister of Gujarat, was rising in popularity across India and his message of development and unity — “Sabka Saath, Sabka Vikas” — captivated the nation. He inspired confidence to a young India that was restless and disillusioned by the Congress-led United Progressive Alliance (UPA), and he made promises of transforming the lives of every Indian. Four-and-a-half years later, the euphoria that welcomed him in 2014 has ebbed, and the high tide of expectations has receded. Under the Bharatiya Janata Party (BJP)-led National Democratic Alliance (NDA) government, farmers have committed suicide, farmer unions are protesting and unemployment is still a burning issue. The Statue of Unity also comes at a time when there are deep social and political divides that run across the length and breadth of the nation. Divisions across political ideologies, on religious and caste identities and on economic lines are unfortunately evident today, and, like never before, they are threatening the unity of India — the India which Sardar Patel amalgamated by bringing together 500-plus princely states. The Statue of Unity is unlikely to bridge these divides. It is in such a situation that many are asking the rationale behind a Rs 2,989-crore statue. The symbolism behind tall, imposing statues is not a new one — in fact, it is an old one which lacks the awe and aura it once had. History is awash with larger-than-life monuments, from the monolithic human figures in Easter Island to the rock cut Jain temples in Gwalior to the Buddhas of Bamiyan in Afghanistan. In more recent history, if the Statue of Liberty symbolised the land of opportunity and modern world, the Soviet Union (and other communist governments) used giant statues for State propaganda. The wave of ‘taller, stronger, mightier’ monuments is now hitting the developing world — it’s no coincidence a majority of recent large statues are in south and south-east Asia . In the 21st century, the developed world shows might through awe-inspiring development projects: Switzerland has the longest rail tunnel, France has the tallest bridge, and Germany has the cleanest city in the world. When juxtaposed with this, the world’s tallest statue offers little comfort. However, the Statue of Unity does give reasons to cheer. It has the potential to become a tourist attraction (thereby improving the local economy) and, as earlier said, befittingly honours the freedom fighter-politician’s contribution to the making of modern India. In a time of deep divide, hatred and efforts to homogenise the nation, Patel’s statue can act as a constant reminder that “India, that is Bharat, shall be a Union of States”. Democracies have a love-hate relationship with statues. Some statues are loved by the people and given an iconic status, such as the Statue of Liberty in New York, United States, the statue of Christ the Redeemer in Rio de Janerio, Brazil or the Spring Temple Buddha statue in Henan, China. Some statues lose their glow and over time earn the wrath of the people — the taking down of numerous Lenin statues across former Soviet states and the 100-plus Confederate monuments across the US are examples. There is a third category, which I feel is a greater injustice to the leader immortalised through the statue — the disregarded statue at the city square, public park or roadside which is covered in pigeon droppings.